It is commonly held that controlled entries into the offensive zone generate more shots and thus we prize controlled entries more than dump and chase or chip and chase entries. Controlled entries are those where the offensive player either carries the puck into the offensive zone on his stick or makes a short pass to a teammate as they enter the zone. If a player skates a few steps into the zone and then dumps the puck in, that is a dump in, not a controlled entry. In a general sense, chip and chase entries are considered dump ins because when the offensive player chips the puck in behind the defense, he loses possession of the puck. I’ve included chip and chase entries as dump ins, but I’ve also broken out chip and chase data into its own category as well. This is partially due to the fact that chip and chase entries generally seem to have a bit more success in terms of regaining possession than regular dump and chase entries do. Plays where a forward simply deflects a hard pass from a defenseman into the offensive zone and then chases in to try to retrieve it are considered dump ins and are attributed to the forward tipping the puck into the zone. These plays are designed to be dump and chase plays and so it behooves us to treat them as such. Zone entries, particularly dump ins, executed solely for the purpose of buying time for a line change, are not recorded as they are not designed to start an offensive attack. Failed entries are fairly simple. If a player attempts to skate or pass the puck into the offensive zone, but a defenseman poke checks it away or forces a turnover and gets possession of the puck a few steps into the offensive zone, the entry has failed. When a player brings the puck back into his own defensive zone to regroup and go on the attack, but pressure from the opposing team forces a turnover and results in the opposing team gaining possession, the entry is considered a turnover entry. These are the rarest of the zone entries as you may well imagine. The following information is for even strength play only (5v5, 4v4, etc) and also empty net situations. All data herein was tracked, collected and analyzed by Jennifer Lute Costella. If you share this information, please give proper attribution as this information is not available publicly through any websites or organizations and represents the work product of Jennifer Lute Costella. You may click on each picture below to see a larger image. Where you see “Success” or “Fail”, it refers to whether possession of the puck was achieved after an uncontrolled zone entry. Even if there was no shot attempt, if the attacking team was able to get possession, it counts as a successful entry. 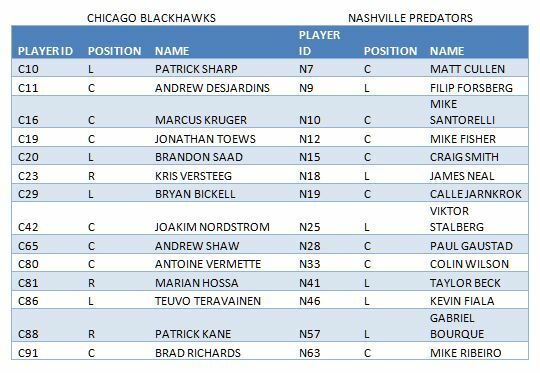 You’ll note that in the games Chicago lost to Nashville, they carried the puck in less than Nashville did. Chicago’s share of the controlled zone entries in Game 2 was 43.94% versus Nashville’s 56.06% and in Game 5 was 48.05% versus Nashville’s 51.95%. When Nashville’s defensive systems forced controlled entries to fail and Chicago had to resort to dumping the puck in, the Blackhawks had trouble generating offense. When Nashville carried the puck in a lot successfully, they essentially ran roughshod over Chicago’s defense. Time: The time on the game clock at which point the zone entry was carried out. Targeted D: Defensive player responsible for the side of the ice through which the puck carrier entered the zone. On Dump in entries, this is the defensive player pressuring the puck carrier to dump the puck in. Fwd Assisting D: A defensive player helping the Targeted D to defend against the zone entry, usually as a result of the neutral zone forechecking system being used. Where blank, no forward was actively assisting the Targeted D in defeating the zone entry. Chicago’s only goal at even strength that came following a traditional dump in entry was the game winner in the second overtime of Game 1. Nashville’s goal in the second period came after a faceoff resulting from Craig Smith’s carry in zone entry on the shift prior (with Hjalmarsson and Desjardins defending the entry). Vermette’s goal in the first period, while listed as a dump in entry, was actually a chip and chase entry by Patrick Sharp. Wilson’s third period goal followed a faceoff brought about by chip and chase entry executed on the prior shift by Jarnkrok with Rozsival defending the entry. Kane’s goal in the first period followed a faceoff resulting from a carry in entry by Richards on the prior shift with Ekholm and Ribeiro defending against the entry. Keith’s third period game winner came after Saad executed a chip and chase entry with Jones defending. While Nashville found success in generating offense from various forms of entering the zone, Chicago’s goals came almost entirely, at even strength, from carrying the puck into the zone. Below is a table showing shot generation (Fenwick or USAT, i.e. unblocked shots) for different types of entries for both teams throughout the series. Both teams generated far more shots per entry when they carried the puck into the zone as you can see. Part 2 of this look at the Zone Entries will be posted shortly and will examine each player’s zone entries and shot generation throughout the series.